Want fairly extreme flexibility as regards your photographic compositions without paying a king's ransom? 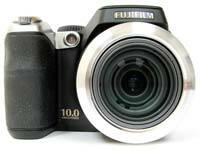 The 10 megapixel Fujifilm FinePix S8100fd, its suffix indicating built-in face detection, purports to deliver a huge 18x optical zoom range (27-486mm equivalent in 35mm terms) for an 'affordable' price; this translates as a suggested �299.99 in the UK, which isn't much more that other 3x zoom 10 megapixel compacts. Despite that broad zoom range and its DSLR 'lite' styling, the 10 megapixel S8100fd is smaller and more obviously constructed from plastic than its weighty and rugged bigger brother in the 14.3x optical zoom S100FS. 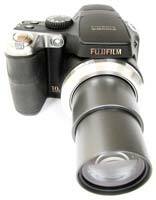 But then, as one of the more compact super zooms around, it can be had for up to �230 cheaper. So what else do you get for that almost pocket-money price? To avoid the tell-tale signs of camera shake and external hand wobble, the solidly built S8100fd features CCD-shift image stabilization for claimed blur free photography, plus light sensitivity up to ISO 6400, 13 scene modes, 2.5-inch LCD with anti glare coating, 230k pixel resolution, 60fps refresh rate and electronic viewfinder, super macro mode affording shots 1cm from the subject, the aforementioned face detection technology and new 'instant zoom' feature. After zooming in on a subject, a single button press gives an additional 1.4x or 2x digital zoom (in effect then, a 'crop') at the centre focus region of the frame. Images are saved to either 58MB of internal memory, or optional xD-Picture Card, SD or SDHC card courtesy of a dual card slot secreted on the right hand side of the Fujifilm FinePix S8100fd's body. As with the S100FS, the S8100fd automatically removes the blight of red eye from portraits taken with flash when in face detection mode, while Fujifilm claims the camera is intelligent enough to able to detect subtle variations in lighting and adjust intensity accordingly. Another useful feature given the camera's potential usage by a wide (and very probably a family) audience is a maximum continuous capture speed of an incredible 13.5 fps up to 33 frames, if you don't mind the compromise of a resolution drop to three megapixels. Alternatively 6.8fps is offered at five megapixels, which appears the preferred compromise. As this is a budget bridge model, so known because it forms a link between a point and shoot compact and a fully-fledged DSLR, power comes courtesy of four AA batteries. Non-rechargeable alkaline cells are provided out of the box, which Fujifilm claims are good for up to 300 shots (with the ability to boost this up to 500 with NiMH rechargeables). The fact that these slot into the base of the handgrip means that the grip itself is large enough for the user to get a good firm hold, non-slip rubber padding at the rear allowing sufficient purchase for the thumb as your fingers tighten around the front. Picking up the camera then, the Fujifilm FinePix S8100fd feels chunky and reasonably solid in the palm despite the mainly plastic construction, any concessions to price disguised to an extent by the body's (mainly) matt black finish. As our product images reveal, the front of the camera is dominated by a large projecting lens barrel for which a protective clip on plastic cap and thread is provided, top left of which � if viewing the camera lens-on � is a dual-use window for the AF assist illuminator and blinking self timer lamp, a feature given more room to breathe than on, ironically, the physically larger S100FS. Immediate left of this juts forward the aforementioned handgrip with spongy leather effect padding, the projection of the grip stopping just short of that of the lens barrel when non operational. This leaves enough room between the two for all but the most sausage-fingered user to comfortably tuck their digits. Top right of the lens barrel, located on the gentle slope that retreats away from the pop up flash, is a dedicated button for its spring-loaded activation, just behind which is an easy to miss pinprick hole for the S8100fd's built-in mono microphone. Looking down on the camera we find a reasonably uncluttered top plate with large user friendly controls, chief among them being a bottle top style mode wheel nestling next to the hump that houses the flash. This wheel, however, does cram in 11 shooting options, starting with full auto capture and, moving in an anti clockwise direction, following with the familiar creative quartet of program, shutter priority, aperture priority, aperture priority and manual mode. Next comes video mode � a pretty standard 640x480 pixels resolution at 30 frames per second, and with mono sound � you can judge what the quality is like for yourself by playing the clip provided, but rather sadly the zoom is disabled in this mode. Next up is a mode marked 'SP' � not, as might be assumed, a sports photography setting, but rather a dedicated portrait mode, which claims to imbue shots with a flattering softness and healthy skin tones. Next on the dial is a more interesting setting still for 'zoom bracketing', which basically provides the user with a full size image and two progressive crops, or digital zooms. As a hand holding feature for the inexperienced who can't decide on the best framing at the time � and don't want to bother with any image editing later � it could be considered useful. The next mode on the dial, natural light and flash, is again a hand holding one for the indecisive or inexperienced. Asking you via the rear view screen to activate the pop up flash, the camera proceeds to capture one image using natural light and a second using the flash, allowing the user to compare treatments and decide the best result � the two briefly shown side by side on screen while being written to card or internal memory. Though, generally, use of the FinePix S8100fd is intuitive, Fujifilm hasn't helped out by providing the full manual on CD ROM only. Still, and moving on, the adjacent mode is a 'pure' natural light mode to retain natural ambience in low light scenarios without the flash (the camera automatically selecting the right ISO), while the final offering on the dial, indicated by a radioactive-looking stick figure, is a dedicated image stabilisation/anti shake mode. Incidentally, this is backed up by an adjacent dual IS button (faster shutter speed, higher ISO plus CCD shift mechanism) with the familiar wobbly hand, just forward of which is a face detection button which also acts to automatically remove the bane of red eye from your people shots, or not if you manually de-select it � a button and function that is identical to that found on the S100FS from Fujifilm. Just forward of these two large black buttons is a chunky silver and very cheap plastic looking slider switch for turning the S8100fd on or off, which unfortunately marrs the camera's otherwise sophisticated outward appearance. Still the chunky size does avoid any confusion between power on and shutter button for the digital novice, and with a press of the shutter release just in front the camera is quick to power up in just under two seconds, the rear screen flickering into life (unless you've been otherwise using the electronic viewfinder prior to shutting down) and the lens extending just proud of its barrel housing as it adjusts to maximum wideangle setting. 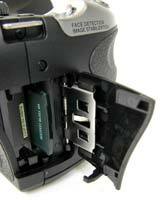 The main shutter release button is set slightly higher than the other controls and is here encircled by the zoom lever. It's easy to determine the halfway point of the former, letting the camera more or less instantaneously determine focus and exposure without accidentally firing off a shot. Writing speed is similarly swift, with nary a wait between one JPEG and the next. A twist of the zoom lever and that is equally quick to respond, its activity sound tracked by a mechanized whirr. The zoom action is not the smoothest however, in fact it's slightly jerky when moving in or out, so it's a mixed blessing that you can't use it in movie mode. Moving to the back of the Fujifilm FinePix S8100fd we discover the aforementioned LCD screen gobbling up the most 'real estate', above which is a chunky eyepiece housing the electronic viewfinder (EVF). This is provided a very small window half the size of that found on the more expensive S100F. The diminutive size gives users even less of an incentive to bother with the EVF � it automatically has you squinting to view � and perhaps Fujifilm's half-hearted inclusion of the feature is a reflection of the fact that this camera is aimed more at a family audience who will welcome the larger main LCD for shot composition and review. That being the case it would have been pleasing to find a 3-inch LCD rather than the 2.5-inches provided, though its 230k resolution is perfectly adequate for visibility. 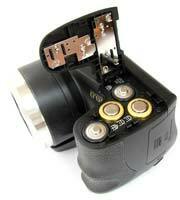 Again, as with the S100FS, a dedicated EVF/LCD button affords a quick swap between the two. To the right of the screen, recessed into the rear rubber padding is a centrally placed four-way controller with central menu/OK button. Located at the four points around its circumference are a means of selecting macro and super macro close up modes, deleting duff images on the fly when in playback mode, selecting the various flash options or � and this is a feature you might expect to more usually find on the top mode dial � select from the various continuous capture options, with incremental decreases in pixel count the faster the speed. Pressing the central menu button in auto capture mode brings up just the one folder onscreen offering three stark choices � the ability to turn the self timer on or off, high speed shooting on or off and lastly, access one further set up menu. Tab along to this option and you're presented with a further four folders, offering the ability to activate or deactivate the AF illuminator and digital zoom, adjust LCD brightness and operational sounds, format the card or memory in use, swap language in use and video output: all fairly standard stuff. Press the menu button when you have turned the dial a setting along to program mode however and, unsurprisingly, a much wider array of shooting menu options are presented. These include manual adjustment of white balance, selection of metering modes (multi, spot or average), AF modes and also the fine-tuning of sharpness, flash intensity and exposure bracketing. The Fujifilm FinePix S8100fd's menus are clearly laid out and the swapping between and selecting of chosen options as rapid as you'd expect � a nice touch being that, in shooting mode at least, such options are presented as an image overlay, so you're not losing sight of the possible shot you're making the adjustments in readiness for. Menu options aside, there are a further two buttons above and below the central control pad. Top left is the familiar green triangle that indicates a means of image playback, while to the right is the 'F' (for 'photo') mode commonly found on Fujifilm's compact range. As with the manufacturer's other models it provides one-button-press access to a trio of essential shooting functions, including the ability to manually adjust ISO, choose capture resolution and image compression levels, plus choose from one of a brief range of FinePix colour effects. These include the default 'standard' setting used for the majority of our test images, a more vivid 'chrome' setting for a dynamic, stylised look, and the self-explanatory black and white. The bottom two buttons located near the S8100fd's base are, to the left, a display/back button with which to call up regular shooting information onscreen, including a nine screen compositional grid, or attempt to marry up a trio of three sequential shots at a time � useful if you are planning to attempt a panorama or digital composite later. The final button, to the right is for adjusting exposure compensation, which calls up both the familiar sliding EV scale on screen plus a real time histogram. The last features at the rear of the camera are an indicator lamp top left of the back that flashes while an image is being committed to memory, and a dioptre adjustment wheel for the myopic sitting alongside it, set slightly into the side of the eye cup for the EVF. As on the S100F, the right hand flank of the camera, if still viewed from the rear, features a sliding cover protecting the dual format card slot that allows either the xD-Picture Card in which Fujifilm has a vested interest to be used or, alternatively, the more popular and widely available (not to mention higher capacity) SD/SDHC card. The left hand flank, highlighted by an unattractive strip of silver plastic, is home to the S8100fd's built in speaker and below, a soft plastic flap hiding ports for AV out and USB connection, plus DC (power) in. Up-end the camera and at the base you'll find a central screw thread for attaching the camera to a tripod, adjacent to which is a large siding cover for the battery compartment housing the four AAs. Battery life is pretty good considering that after using the camera on and off over a four day period there were no signs of flagging power, although a onscreen battery life indicator might be another helpful feature. 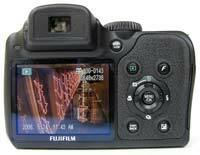 So what of the Fujifilm FinePix S8100fd's images? Do they live up to the camera's FinePix moniker, or is the outlook decidedly chilly? PhotographyBLOG is a member of the DIWA organisation. Our test results for the Fujifilm FinePix S8100fd have been submitted to DIWA for comparison with test results for different samples of the same camera model supplied by other DIWA member sites.